Retinal dystrophies are the major causes of incurable blindness in the Western world. Our insight into their aetiology has improved remarkably over the past decade and a number of key genes have been identified. Together with a more detailed understanding of disease processes, this knowledge is stimulating new approaches to therapeutic strategies involving gene therapy, growth factors and retinal cell transplantation. Molecular genetic studies have provided detailed information on the pathogenesis of retinal dystrophies. An important proof of principle that gene therapy holds great promise for the treatment of these conditions was demonstrated in the rds mouse: introduction of a functional copy of the peripherin gene subretinally resulted in complete rescue of rod outer segment structure. Novel approaches are being developed based on the manipulation of biochemical pathways that previously were not considered relevant to these diseases. For example, renewed interest in retinal dystrophy pathogenesis led to the successful use of high dose vitamin A treatment in Sorsby fundus dystrophy. 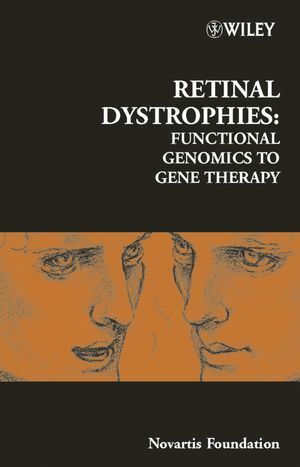 This important new book covers all aspects of retinal dystrophies from the molecular and developmental biology of these disorders to possible therapeutic approaches, with special reference to gene therapy. Specific chapters deal with the molecular genetics of gene therapies, clinical genetic studies, molecular and cellular mechanisms of the development of the disease, functional genomics of retinal diseases, animal models of retinal dystrophies, and finally with studies on gene therapeutic approaches to correcting the disorder. With contributions by many of the leading researchers worldwide, this book is likely to be an important milestone in this rapidly developing field. Chair's Introduction (Shomi S Battacharya). Gene therapy of retinal dystrophies: Achievements, challenges and prospects (Dean Bok). Identifying retinal disease genes: how far have we come, how far do we have to go? (Stephen P Daiger). Dominant cone and cone-rod dystrophies: functional analysis of mutations in regGC1 and GCAP1 (David Hunt, Susan E Wilkie, Richard Newbold, Evelyne Deery, Martin J Warren, Shomi S Battacharya, and Kang Zhang). Isotretinoin treatment inhibits lipofuscin accumulation in a mouse model of recessive Stargardt's macular degeneration (Roxana A Radu, Nathan L Mata, Steven Nusinowitz, Xinran Liu, and Gabriel H Travis). The expanding roles of ABCA4 and CRB1 in inherited blindness (F P M Cremers, A Maugeri, A I den Hollander, and C B Hoyng). What should a clinician know to be prepared for the advent of treatment of retinal dystrophies? (Alan C Bird). Role of subunit assembly in autosomal dominant retinitis pigmentosa link ed to mutations in perpherin 2 (Robert S Molday, Laurie L Molday, and Christopher J R Loewen). The search for rod-dependent cone viability factors, secretedd factors promoting cone viability (Thierry Leveillard, Saddek Mohand-Said, Anne-Claire Fintz, George Lambrou, and Jose-Alain Sahel). Studies on retinal and retinal pigment epithelial gene expression (Itay Chowers, Noriko Esumi, Peter Campochiaro, and Donald J Zack). From disease genes to cellular pathways: a progress report (J Yu, A J Mears, S Yoshida, R Farjo, T A Carter, D Ghosh, A Hero, C Barlow, and A Swaroop). Prospects for gene therapy (Robin R Ali). Range of retinal diseases potentially treatable by AAV-vectored gene therapy (William S Hauswirth, Quihong Li, Brian Raisler, Adrian M Timmers, Kenneth I Berns, John G Flannery, Matthew M LaVail, and Alfred S Lewin). Gene therapy for Leber congenital amaurosis (Jean Bennett).